Tyron Woodley and Colby Covington have one of the biggest rivalries currently in the UFC. The two simply don’t like each other and have been on a collision course ever since Covington won the interim title back in June by defeating Rafael dos Anjos at UFC 225. However, after “Chaos” suffered an injury, the promotion decided to pit Tyron Woodley against Darren Till at September’s UFC 228 event. “The Chosen One” ultimately submitted the previously undefeated Liverpool native in round two that night in Dallas. Following his impressive finish of Darren Till, Tyron Woodley announced that he had injured his hand in the fight and would require surgery. That news resulted in Colby Covington accusing Woodley of ‘ducking’ him. Well, during his “Hollywood Beatdown” show on TMZ, Tyron Woodley appeared ready and willing to fight ‘Chaos’. Tyron Woodley claims to already know what Colby Covington’s plan will be for their potential showdown. Covington has said that he will ‘end’ Woodley’s career when they fight, but obviously ‘The Chosen One’ isn’t buying that. Woodley believes Covington will be scared to stand up with him. Meaning, he will simply just try and take him down over and over again. Because of that, Woodley is offering ‘Chaos’ a bet for their fight. “I bet you 10 thousand dollars everytime you touch my leg for a shot you got to pay me 10 grand,” Woodley said. “He might not even take me down. I want the people to see what it is for what it is. You want to see these hands. He wants to try and outwrestle me and he can’t even do that. I am challenging you, no wrestling. You touch my leg it is 10 bands. If I touch your leg I’ll give you 20 grand. The bet doesn’t appear to make a whole lot of sense for Covington, given he is a world class wrestler. Ultimately, it will be interesting to see how the brash welterweight decides to respond to Tyron Woodley’s offer. While Tyron Woodley seems to be content on fight ‘Chaos’, UFC President recently revealed that he is willing to move on from the matchup. 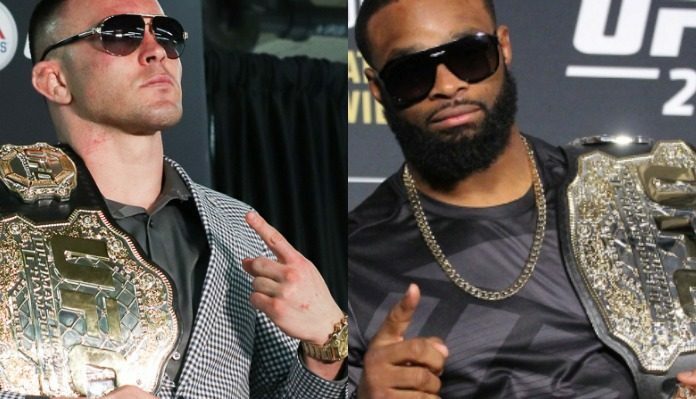 Who do you think will win if Tyron Woodley and Colby Covington actually square off in the new year?